Im showing off my neweest shoe love, clearly a pair of burgundy t-bars were missin in my wardrobe. ;) Everything else is old stuff, but I feel thrilled when I come up with new ways to style them, beats the feeling of a new item in fact! :) I must really shop my closet more often! Yes, red is the perfect medicine for rainy days, double dose please! Love both the old and the new items and how you combined them. I can't believe that you found those fab shoes at Din Sko! I always thought Din Sko is a Swedish brand, but I might be wrong? Oh yes, those shoes are worth building an outfit around! And your colorful skirt is a great piece too. I always enjoy your use of color! Thanks for sharing with Visible Monday, Izzy. Gorgeous skirt. Red is my favorite winter color. It goes great with lots of darker colors and still feel like a cold weather color. I love the patches on your skirt. I think I'm learning that I really like Boden! I don't know, you seem to have plenty of very appropriate words for the dentist...lol. My feelings exactly. I think your closet must be an amazing place full of magical separates, better than a store! You look perfectly wonderful as always. How beautiful! Your use of colour is wonderful. I love red, and your rainy day ideas too. :) Sorry you have to see the dentist - I hope it goes as well as it can. Good luck! I love this outfit, Izzy! You look just gorgeous in it. 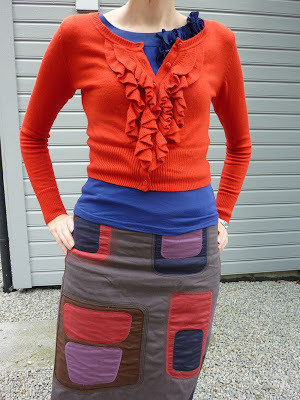 The skirt is so cool, and I love those shoes (I wore t-straps today too!). Every year Boden has a few pieces that are insanely fabulous. This skirt is on of them! I love geometric prints. Love the shoes too. Yup Boden do have some not to miss items every season, I usually buy a dress and a skirt from every collection. Lovely colourful outfit - just the thing on a rainy day! The shoes are gorgeous! I hate the dentist too, and flying - also with sleepless nights before, and stomach problems! But after the visit, I feel so strong and victorious! Beating one's fears is the most important fight in this life!